[How Do I Find Out?] How Much of my Memory Is In Use? It is often important to check memory usage and memory used per process on servers so that resources do not fall short and users are able to access the server. For example a website. If you are running a webserver, then the server must have enough memory to serve the visitors to the site. If not, the site would become very slow or even go down when there is a traffic spike, simply because memory would fall short. vmstat and free commands in Linux based operating systems are powerful tools for viewing memory allocation. They are tools that server administrators should understand well, but (like many Linux tools) can be confusing. This article explains output and some typical ways you might want to use them. For this tutorial we are using Ubuntu 16.04 distribution, however you should be able to use it for all Debian and Ubuntu distributions we offer on Time4VPS. - All numbers are in Kilobytes (KB) (i.e. 1024 bytes) by default, but this can be customized (see below). - The shared column is obsolete. (This is noted on the free man page). - The output shows memory sizes and allocation for RAM and swap memory, but it also explains how much of that physical RAM is allocated for buffering and caching when it is being used by an application. The m option displays all data in MB. The total of 16384 MB is the total amount of RAM installed on the system, that is 16 GB. 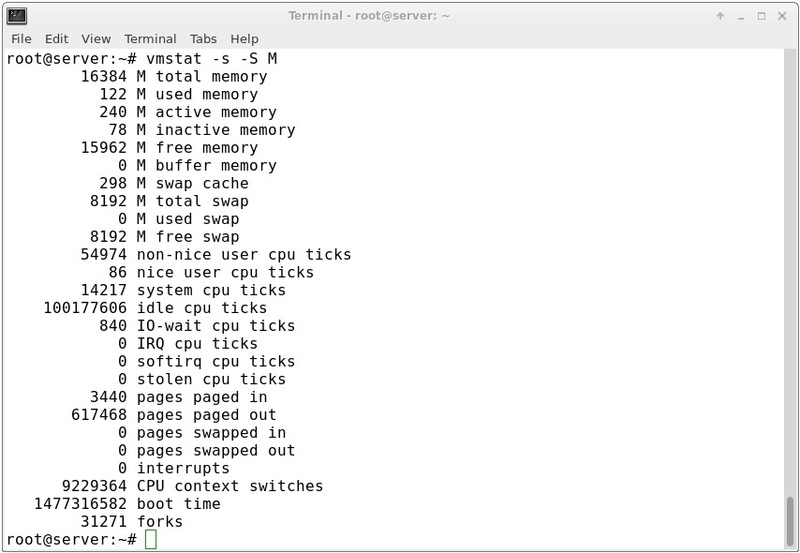 The used column shows the amount of RAM that has been used by Linux, in this case 124 MB. The output is pretty self explanatory. Linux has the habit of caching lots of things for faster performance, so that memory can be freed and used if needed. The last line is the swap memory, which in this case is lying entirely free. vmstat (virtual memory statistics) is a computer system monitoring tool that collects and displays summary information about operating system memory, processes, interrupts, paging and block I/O. Users of vmstat can specify a sampling interval which permits observing system activity in near-real time. As you can see, this tool helps us break down the "-/+ buffers/cache" category of the "free" command. We get to see how much of that block is used for buffering and how much for cache.